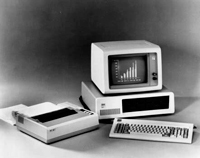 The dumb VT100 terminals were gradually replaced by first Personal Computers (PC) and more and more work was done with programs running in them. The first IBM PC in 1981 ran on a 4.77 MHz Intel 8088 microprocessor. It had 16 kilobytes of memory, expandable to 256k. The PC came with one or two 160k floppy disk drives and an optional colour monitor. The operation system was MS-DOS with a command line interface. 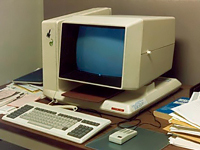 Both electronic and mechanical design work was moved to more efficient Apollo computer workstations, which had a graphical interface, ran on a Motorola 68000 microprocessor and used Aegis (later Domain/OS) operating system. The Aegis-Domain/OS was a networking operating system with Unix like features. The electronics designers used Mentor Graphics software. Other tasks like database work, project administration and other general tasks were still done in VAXes with personal computers acting as terminals via terminal emulator programs. Apple's Macintosh was the first personal computer to use a graphical interface and mouse in its operating system (MAC OS) in 1984. Microsoft's first version of Windows was introduced in 1985. A little later PC's were networked into Windows based PC networks using Local Area Network. The programs were running in PC's and dedicated PC's were acting as servers for sharing resources like printers, mail, internet and common file areas. The PC support function was an important part of organisation and gradually a centralised workstation management was a must. Wiser people started to talk about paperless office. They were wrong. The Windows workstations and shared workgroup directories increased the productivity but we also hit all records in supporting Finnish paper and pulp industry with the heaps of papers everyone was producing with the aid of PC's and network printers. Already in the 80's there existed several designs of portable computers, but the present laptop like portables came out in the beginning of the 90's, Apple Powerbook as one of the first. At first laptops (also called notebooks) were very expensive and only some people could use them, often as a second computer, which could be carried to presentations or to home. However, as their efficiency/price ratio improved, they started to replace desktops totally in some areas of work. For example my last computer at work was a IBM Thinkpad T30 laptop. It had a Pentium 4-m 2.5 GHz processor, 1 GB memory, 40GB hard disk, an internal DVD drive and a 14 inch TFT screen. At my own desk I had it attached into a docking station and I used more ergonomic periferials, a separate keyboard, mouse and a big monitor screen with it. In the area of personal computers even smaller ones have come out, such as Personal Digital Assistant (PDA) devices (also called Palmtops), mobile communicators and other high-end mobile phones, which all contain a computer of some kind, just to mention a few.